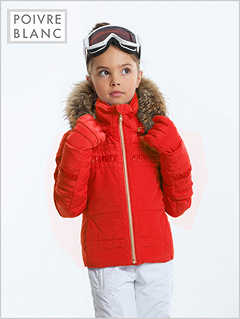 We have the very best collection of children's ski wear and all the necessary accessories for kids from 3 months to the teens. Great styles from Poivre Blanc, Helly Hansen, Fusalp No Panik, junior O'Neill, Roxy, Campagnolo and White Rock plus many accessory ranges. Beautifully made French design from babies to the teens for boys and girls. Pictured left is the Poivre Blanc Madeline jacket for girls. As sophisticated as the adult jackets, this jacket also has the tech - fully insulated, waterproof, windproof and breathable with lots of added features. Many more styles available in the Poivre Blanc kids ski wear range going from babies to junior with styles from super cute to ultra sophisticated like mum or dad. Check out Poivre Blanc in the on-line shop - click here. 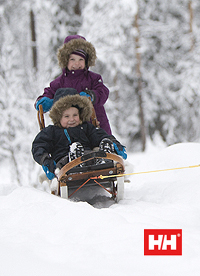 At Helly Hansen Kids outerwear is a specialty. Clothing is designed to keep your kids warm, dry and comfortable so they can fully enjoy snow sports or simply playing in the snow or just cold weather. Smart designs that combine warmth with comfort and technical fabrics. Great colours, up to the minute designs influenced by the board scene. Whether you're a boarder or a skier O'Neill provides snow gear that looks the part and is tough, practical and has loads of added features. Forever a popular choice and excellent value. We stock a great range of O'Neill accessories to match - shirts, gloves, fleeces, hats and bags complete the collection. 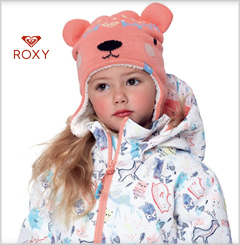 Roxy is all about fun, fashion and snow. Practical ski and board wear in fun, bold and bright designs. See the girls Mint jacket with Girl band pants (pictured left). Roxy girls are always making a statement! Go to the on-line shop to view the full Roxy girls range - click here. Other ranges include Brugi, Fusalp and White Rock. Looking for a bargain? We've still got some items in our stock clearance, so take a peek while stock lasts. Sporty looking Italian range of snow separates and one-piece suits at an excellent price. All insulated and using waterproof / breathable outer fabrics, in fun bright colours. Other childrens wear includes Fusalp and White Rock. Looking for a bargain? We've still got some kids wear in our stock clearance, so take a peek while stock lasts. Click here to view all kids wear in the on-line shop now.